Ireland fans will be flooding into Gibraltar ahead of Saturday's opening Euro 2020 qualifier and they arrive with a warning from seasoned travelling supporter Gary Spain. 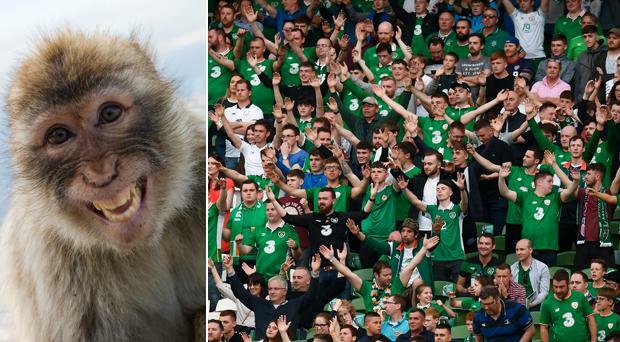 The second coming of Mick McCarthy as Ireland manager will get underway this weekend, with Ireland fans likely to encounter an unusually aggressive Gibraltar native when they land in the southern European outpost. Monkeys have been known to roam the streets in Gibraltar and they have been known to relieve locals of their lunch when they are not looking, as Gary told the Put Em Under Pressure podcast. "There are monkeys roaming the streets in Gibraltar, that is definitely true," said Gary. "You would be unlucky to encounter one in the street, but if you go to the top of the rock, you are guaranteed to encounter loads of them. "Don't bring a backpack. The monkeys will jump on your back and rip it off you! All they want is food and they can open a backpack and take everything out for the world to see. "We saw one woman up there screaming because a monkey had taken her medicine. They can be quite aggressive. You wouldn't want to get into a battle with them." Gary suggested the compact Gibraltar stadium where Ireland will start their Euro 2020 qualifying push lacks the facilities that have become the norm at top international venues, with Ireland fans set to take up a large percentage of the seats in the 2,300-seater venue. "The stadium itself is pretty basic," added Gary. "More along the lines of a second-tier League of Ireland ground. There is an open stand that seats around 900 people and that is for the away fans. "It's fine, it's very safe, but it's not a great stadium. The UEFA rules have got stricter (for stadiums) so I'm a little bit surprised they got away with it. It is a football mad country and I don't think the locals are too happy that we have got half the stadium as we start was is an absolutely crucial campaign for Ireland. "I think it's our most important qualifying campaign ever. For the first time ever, we will have home game in finals in Dublin if we quality. The thought of the Euros happening in Dublin without us is unthinkable. I think that's why Mick got the job now instead of Stephen Kenny."